These words are not just for uttering, but for investigating, to go deep into their meaning. To meditate upon. Buddha means the one who takes us from Darkness to Light, towards wisdom. Towards higher consciousness towards mindfuless. Dhamma is ‘Here – and – Now’, It is not taking refuge into some intellectual writings or anything but something we can access here and now. Sangha Means community, community where people support, help each other in the meditation practice. It is very important to have a community, so that when you are feeling down, when you are not feeling your 100%, or when you are stuck somewhere, the Community is there to Help you, to pull you up. To know that there is some bigger, higher force or energy that is in play, and we all have access to that energy. And how can we access that force that energy? By surrendering, by taking refuge into that higher self, by becoming one with that, by becoming part of that force, that energy. 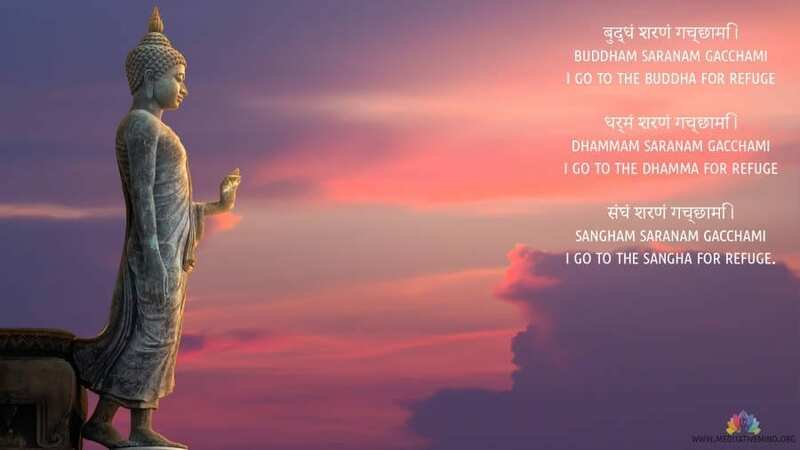 Three Jewels of Buddhism are the Buddha, the Dharma and the Sangha and by reaching or by surrendering oneself to these three heals one from all sufferings and that journey starts with taking refuge in Buddha Dhamma Sangha. This Mantra is also called three gem of Buddhism.